With an appreciation for the many forms and traditions of spiritual practice, this is a valuable and accessible book. 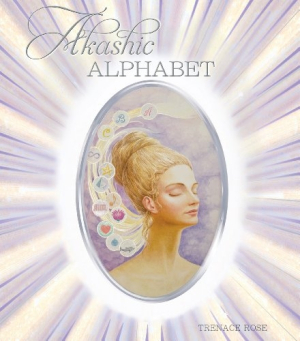 In Akashic Alphabet, Trenace Rose pairs lyrical renditions of the twenty-six-letter alphabet with beautifully colored illustrations by master artist Sergei Iourov. In “Archangel,” a story is told of seven archangels “hovering in a circle over partially re-emerged Atlantis … ancient, volcanic ruins trickling along a rolling reef, surrounded by the vast, turquoise Mediterranean Sea.” The writing has the effect of moving over vast expanses of imagination and reality. Nothing is left out: “Macrocosm and microcosm are one.” At times, however, the use of terminology and descriptions can feel dense, but with the aid of a glossary in the back of the book, the experience of reading the book can turn into a valuable instructional tool as well. While the subject matter is certainly expansive, the book retains an appreciation for the many forms and traditions of spiritual practice, opening the reader’s eyes to beautifully lyrical interpretations of them. In “Blessing,” the spirit of Buddha is captured with soft, touching language that asks readers to see everything around them as capable and changing: “iridescent bluebirds … moonlight … dancing flowers.” In “Rapture,” a scene in the fourteenth century is described: “The young, handsome Spirit of Romeo, resurrected in human form from a coffin nearby, is … pressing an exquisite, long-stemmed, white rose to his heart.” In the accompanying illustration, Romeo can be seen, rose at his chest connected to a rose at Juliet’s, a white shower of glowing energy around him. As companions to the writing, these illustrations are just as enlightening and valuable as the stories that bring them to life. They are large, printed in crisp color, and each captures the spirit of the language and the detail that Rose includes in her writing. While the book’s interpretations and use of terminology are various, this can certainly be read as a valuable and accessible book for a variety of age ranges. Appreciating the attention to visual language and the stories created from them are what make Akashic Alphabet enlightening and in tune with both the large and the small stories. However one approaches Rose’s grand alphabet, each letter will surely compel a reader to open up to his or her own creativity and spiritual awareness, whatever it may be.